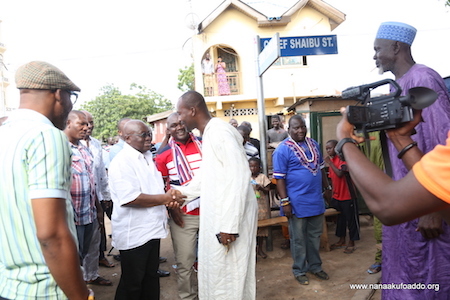 The 2016 presidential candidate of the New Patriotic Party, Nana Addo Dankwa Akufo-Addo, on Friday, May 13, 2016, campaigned in the Ablekuma Central constituency, as part of a four-day tour of the Greater Accra Region. Accompanied by the NPP’s parliamentary candidate for the constituency, Ebenezer Nartey; Policy Advisor, Boakye Agyarko; Laud Commey of the Office of the Flagbearer; Alfred Boye, acting NPP Greater Accra Regional chairman; Adjei Sowah, NPP Greater Accra Regional Secretary; Campaign Aides, Musah Iddrisu Superior and Fatimatu Abubakar, amongst others, Nana Akufo-Addo made surprise visits to Gaskia Zongo and Abossey Okai, where he interacted with residents and business owners at the two stops. Whilst interacting with the Sarkin Zongo, Chief Issah Wanzam, and residents of Gaskia Zongo, the NPP flagbearer reaffirmed his commitment to establishing a Zongo Development Fund aimed at solving the basic infrastructure problems existing in Zongo communities across the country. He noted, however, that if residents were satisfied with their current conditions of living, they should have no problem voting for President Mahama in this year’s elections. “But if you take a look around you, and you are unhappy with your circumstances and you want change, you should vote for Nana Addo Dankwa Akufo-Addo. What is needed in Ghana now is a President who will work to bring jobs to the teeming masses of unemployed youth, some of whom are resident here. This is what Nana Akufo-Addo is going to do when you elect him as President,” he said. On the propaganda making the rounds in Zongo communities that an Akufo-Addo-led NPP government will re-introduce the Aliens’ Compliance Order of 1969, he stated, unequivocally, that “it is a complete, vicious fabrication”. According to him, when President Kufuor was in office from 2001 to 2009, he served as Attorney General and Minister for Justice for two years, and could say with confidence that such a policy was never initiated within the 8 year period. At Abossey Okai, also in the Ablekuma Central constituency, Nana Akufo-Addo assured spare parts dealers at Abossey Okai, as well as Ghanaian entrepreneurs and small business owners, that his government, God-willing from January 2017, will provide a conducive and enabling business environment needed for their businesses to flourish. 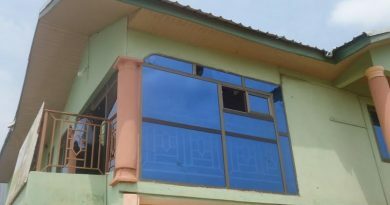 With the major concerns of business owners at Abossey Okai being the unstable nature of Ghana’s currency, high interest rate charges from banks, as well as high import duties at the ports, they told the NPP flagbearer that these problems posed serious challenges to the survival of their businesses. “Because of high import duties, we are forced to transfer this cost onto our customers. Things are very difficult in Ghana at the moment, and as such people do not even patronise our wares anymore. Abossey Okai of all places, which used to be a bustling business hub, is not the same anymore. How can we survive?” a spare parts dealer lamented. Policy Advisor to the NPP flagbearer, Boakye Agyarko, who accompanied Nana Akufo-Addo on his visit to Abossey Okai, stated that no government in Ghana’s history has had more resources, from loans and taxes, than the current Mahama government. 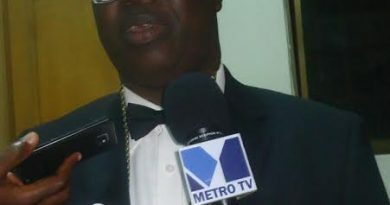 Ghana, he posited, should therefore not find herself in the precarious situation she is in now. “All the money the Mahama government has received has just gone down the drain, and into their pockets, with no accountability whatsoever. President Kufuor showed you a glimpse of what good governance should be like and the progress a country will derive from it. Nana Akufo-Addo, when you give him the opportunity, will do something never seen in Ghana’s history, so your businesses can grow,” he said. 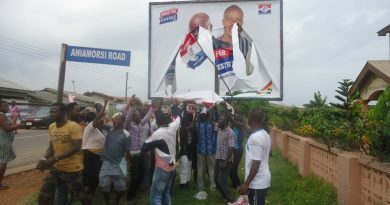 “Volunteers for Akufo-Addo”, a group comprising spare parts dealers in Abossey Okai, pledged GH¢200,000 towards the NPP’s campaign in Ablekuma Central, assuring further that they were going to send the NPP’s message of hope to every part of the constituency, so Ghanaians can rid themselves of the incompetence and corruption that have characterized the Mahama administration.